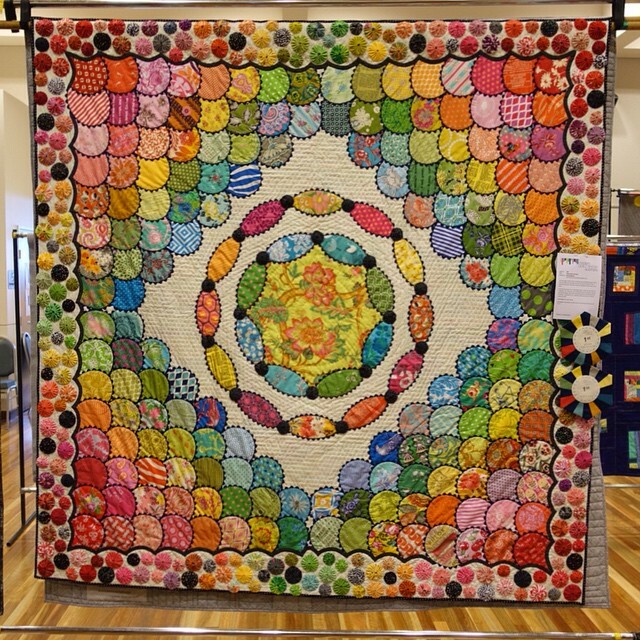 Thank you so much to everyone who entered a quilt in the 2015 Modern Quilt Show Australia, we’ve had so many comments about the high calibre of quilts shown and are pleased to announce our winners. This quilt began with an idea to machine piece clamshells because I didn’t have the patience to sew them by hand. How funny that by the time I reached the borders I decided to make and applique a zillion yoyos, all by hand. It has been described as an “exploding piñata” and an “illustration of hullabaloo” but I chose the name Clamshell Carousel. Just like a carousel with flashing lights, lively music and dancing horses this quilt has all the trimmings – clamshells, ric rac, colourful quilting and yo yos. It almost make you dizzy! 3rd – G’day Quiltcon Group – Bonza, mate! Error: Error validating access token: Session has expired on Thursday, 31-Jan-19 03:34:54 PST. The current time is Tuesday, 23-Apr-19 09:37:18 PDT.